A few weeks ago I had one of those "road to Damascus" moments. It probably had something to do with turning 60. It all started I think when a friend of mine bought a 7mm LNER brake kit from Parkside "by mistake", intending to get a 4mm kit - huh! It got me thinking and then I realised that the Dapol Class 08 shunter was imminent and did some research. There's a version in plain green w/early crest and sound on board. For me this was less than 300 pounds and seems great value compared to other offerings from the likes of Lionheart. So that was preordered. I've been looking around and doing the research on suppliers. Tower Models have a great selection but they're not an online retailer and seem a bit backward so I'll give them a miss. Kernow seem to have a good 7mm selection and I ordered some Slaters embossed brick and roof tile sheets. First off, I did a swap with my friend and acquired the kit. - Turnout kit which includes ready made common crossing and planed blades. Quite pricey but I won't need to do that again since I plan to do all that myself for future turnouts. There's a quite nice tiebar kit from Ambis. - Roller gauges, plain track gauge and back to back gauge. In terms of layout, I haven't got a huge amount of space but I think something 12' long can be accommodated. I've always admired the work of Chris Nevard and his Catcott Burtle is quite lovely. 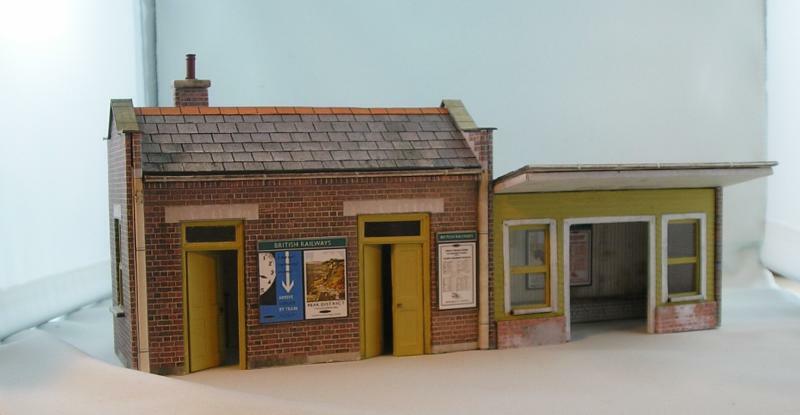 It features a halt, a small goods shed and various other things - all in a small space. 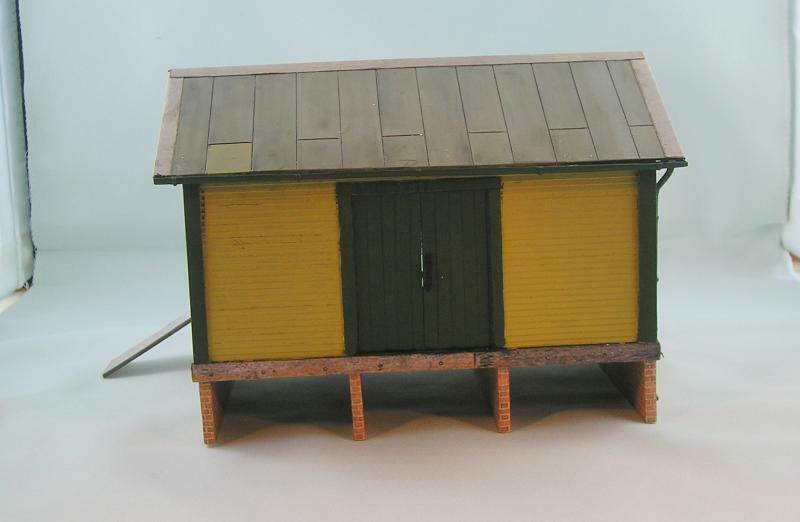 So, waiting for parts for other projects, last weekend I sat down to work on some buildings that I can use for the prospective layout. 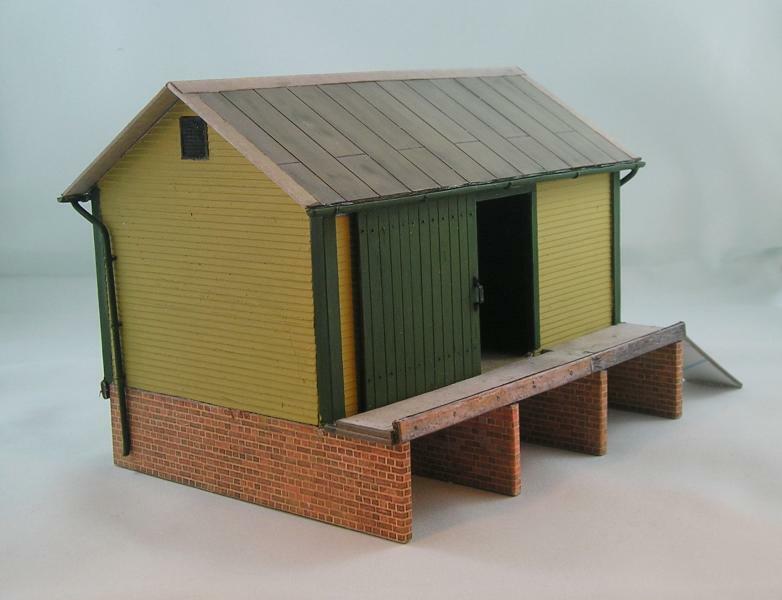 First up was a small goods shed. I used the Scalescenes kit (R002 - which I don't see on the website...odd) as a basis. I realised that I needed to use use textured walls since printed clapboard wouldn't wash in 7mm. I used Evergreen 0.08" spacing clapboard for the outer walls and 0.04" for the inner walls and roof. I made the plastic parts from the templates that come with the kit. The kit prints were enlarged by 176% to get 7mm. Corners are 0.04" strip as are the doors. For the doors I scribed planks using my Olfa carpet cutter and made a representation of wood grain by dragging coarse sandpaper from top to bottom several times. I glued a cross piece on the back and then drilled for 0.045mm NS wire to represent carriage bolts. I also scribed the roof panels to mimic those in the print. I did leave some paper printed parts - the brick piers and platform. Gutters were made (laboriously) by grinding Evergreen 3mm tube to a half round. I glued fine strip around the gutter at intervals to represent bracketing. Downspouts are 2mm brass tube bent as required. I soldered some 0.032" phosphor bronze strips to represent brackets and the tails of these were inserted into holes drilled in the wall. Let me know if I left anything out. This is by way of experiment to see what works. I think it came out well and it will be distressed in the future. 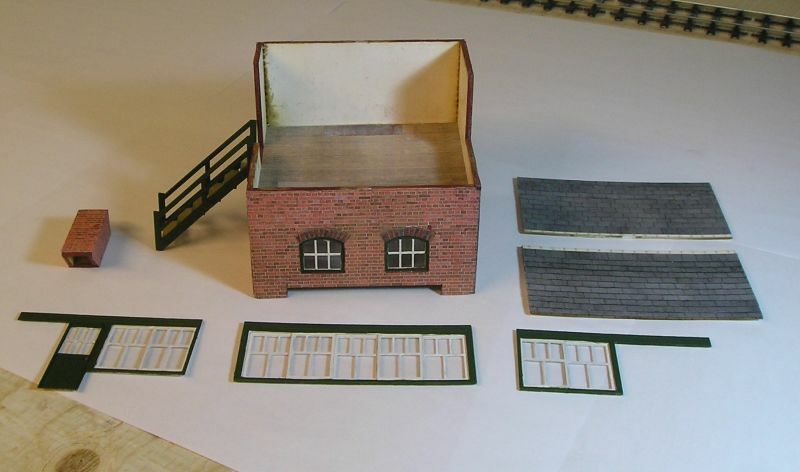 Next I wanted an office for the goods store and it was Scalescenes again, this time the weighbridge/coal office (R024). This is actually a free kit. I think the window gave me the most grief. I made the frame from plastic strip and managed to do a reasonable job. I left the gutters as the kit intended but did make downspouts from brass tube using the same method as above. The chimney is a whitemetal example I found in my collection of 4mm pots. It looks right I think. I flashed the chimney with masking tape. 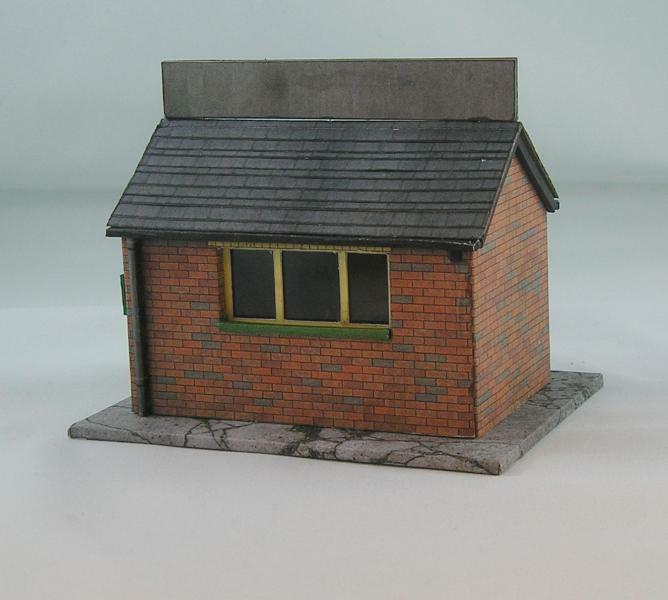 Finally, another freebie, this time from Fine Scale Buildings - a lineside hut. The kit is very nicely designed - instructions run to 12 pages! 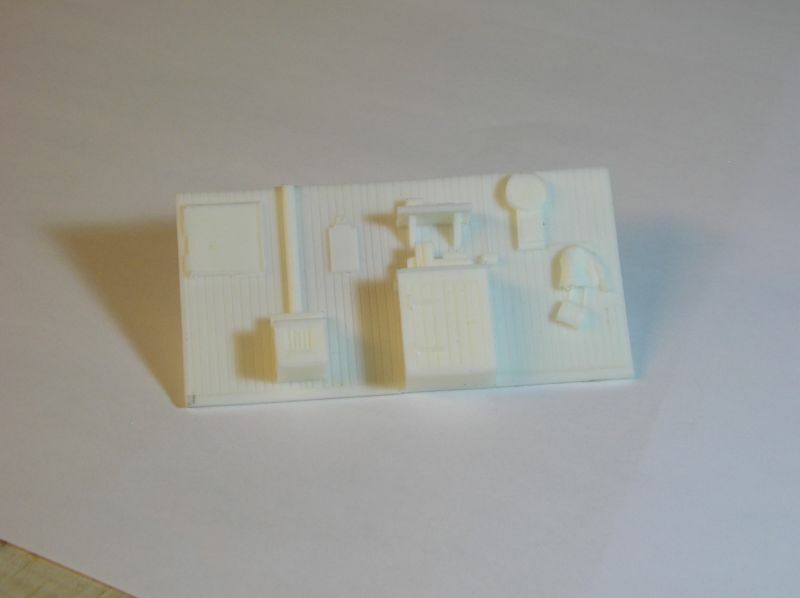 Again, this is made almost entirely from the prints, even the downspouts and gutters. I think this makes into a very attractive model. I liked the base so much I made another for the goods office. Oh yes, the door handle is a pin painted brass. 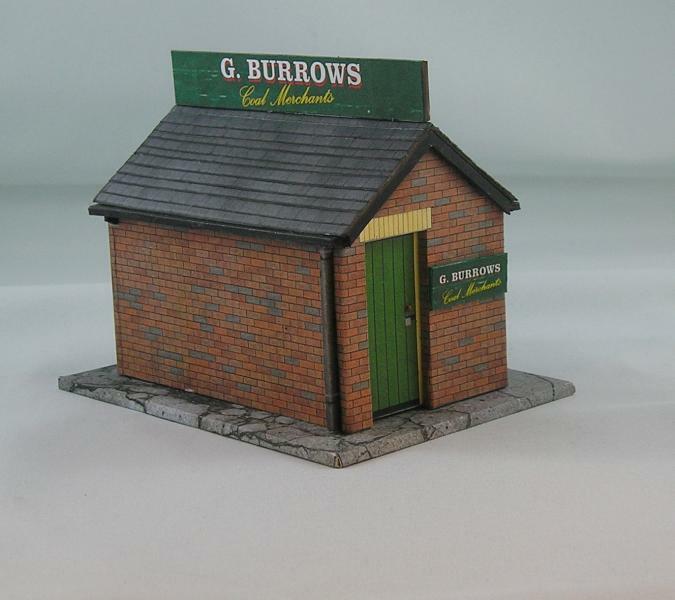 I used signage from the above building to make this a coal merchants office. I have a 4mm halt from Ratio or Wills so I will have a go at scaling that up. Another 7mm modeller is born. We'll all be moving up a scale if we see much more of this stuff John. It is a fabulous scale to work in if you have the "eye". I noticed Hattons did a mail-shot on some of the Dapol 7mm offerings and I was very surprised at how reasonble the prices were, particularly when you think a decent 4mm loco will set you back around £120 to £130. Ok, yes, that's for a mainline loco but I think I might rather have a 7mm tank engine than a 4mm 4-6-2. It would certainly be a close run thing, provided the 7mm job was a "model" rather than a bigger "toy". Dapol seem to be cranking out RTR PO wagons by the wheelbarrow load. There has been criticism about some basic errors on these. There are some BR vans due out soon which are getting encouraging words - too modern for me alas (introduced in 1967). Kits from Parkside aren't much cheaper than RTR but at least they're likely to be right - something you want in 7mm. As for the slates on the coal office, you are right they are not even. The red dotted lines on the base were not evenly spaced and I foillowed those - I think (hope) it's deliberate. Went to Michaels today and got myself a load of basswood - I'll use this for the halt. So, for the last couple of days I've been labouring away on my halt. I had a search for plausible timber construction methods and, to my delight, found a copy of a works drawing of a workmens' platform. This is to be found in "A Pictorial Record of Midland Railway Architecture" by V.R. Anderson and G.K. Fox (OPC). These platforms were temporary structures built in WW1 for the use of war industry workers. I'm not concerned about that really, I just wanted my halt to look reasonable. The sketch should clear things up. Construction consists of alternating lateral and longitudinal trusses. The real thing was 700' long! I'm looking at accommodating a single coach, maybe two if the second is a brake. I had wanted to use basswood but a trial assembly with CA and PVA proved to be unsatisfactory. I used Evergreen styrene instead. The crosspieces are all supposed to be angle, however, I could only get one packet of this. So I put the angle where it will be visible and plain strip everwhere else. Just as well since the angle is about 0.010" thick and very flimsy. I made a number of jigs from card to hold everything in place while the glue dried. I've cut the platform deck from 0.040" and 0.020" sheet to try to get close to the real thickness of 3". I scribed the 0.040" into scale 9" wide planks and glued this to the 0.020" sheet. I also rubbed the top deck with coarse sandpaper to get the grain. Welcome to the wonderful world of 7mm. There is some nice Lima stuff still around. 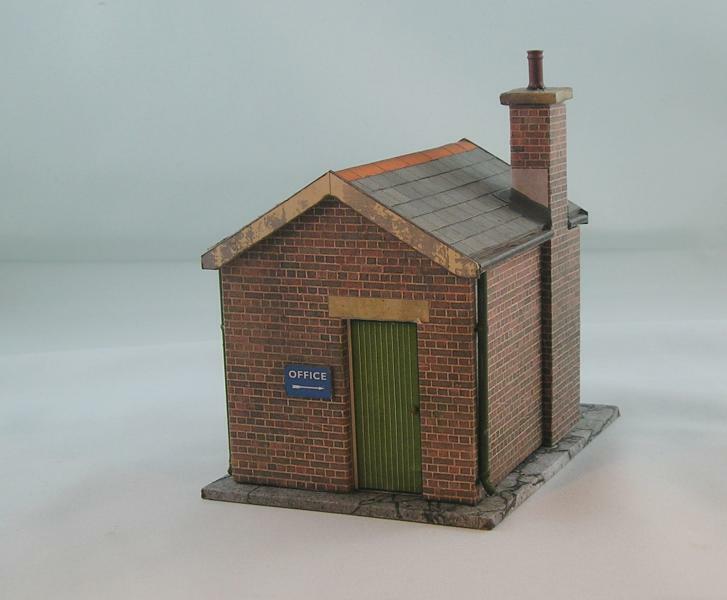 Bachmann Brassworks is I think associated with Tower Models. Both are San Cheng built I believe. Don't forget Heljan O scale. 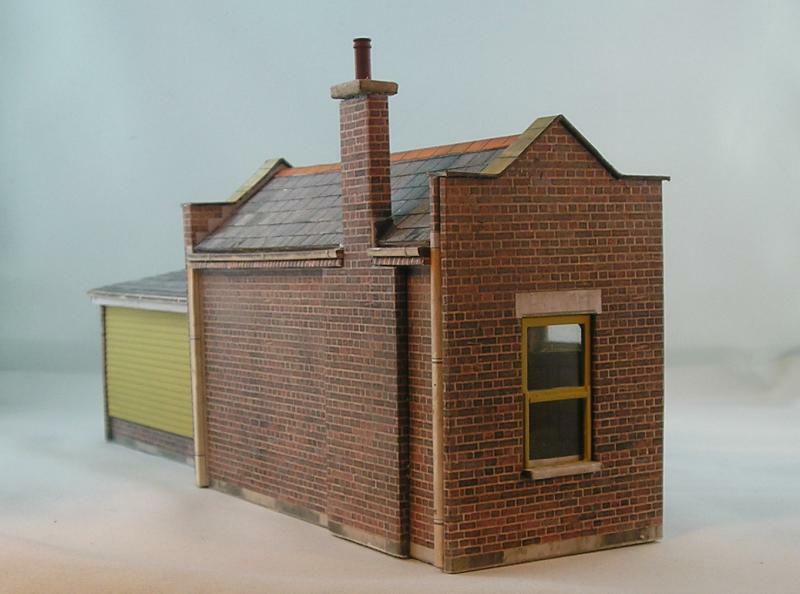 Ixion did a superb job on the N-gauge Manor, they did a very nice Hudswell Clarke 0-6-0 (second hand these days). Wonderful range of kits still available. Hi Nigel. I've been perusing the sites - must join Gauge 0 Guild I think. I saw some Lima stuff on Hattons used section - not impressed I'm afraid. Heljans' stuff is good but most of it is after the era I want to model, a great many large diesels -- not really what I have in mind ... seems overpriced too. Ixion locos are lovely and I won't close the door on those. Right now my motive power is envisioned to be the 08 and the Dave Jones 0-6-0ST austerity. Bachmanns stuff seem to emulate unicorns - few to be found. I'd love to see Hornby and/or Bachmann follow Dapol to produce reasonably priced RTR. I see Dapol have formalized their relationship with Lionheart and seem to have amalgamated their ranges. Some lovely GWR panniers on offer. The piers are longer than needed - the drawing shows them sunk into the ground, perhaps I'll use some foamcore board as a base. I had second thoughts about the length and increased it by about 7 in. to 33" overall and 21" over the passenger portion. According to the drawing the deck is 9' and 3" thick. I laminated 0.040" and 0.020" sheet to get close to that. The top was scribed for 9" planks and then coarse sandpaper was dragged along the length to simulate grain. I still need to make fencing for the back and some sort of shelter. Lamps and seats will be needed too. Do you have plans for a black wash over it - or something? It's still bare plastic Max. Yes, it will be painted and weathered. A lot of construction yet to do though. Just caught your earlier comment regarding gluing basswood. It can be glued successfully with both CA and PVA (white) glue), as well as contact adhesive (UHU or similar), but the surfaces to be glued require a bit of preparation. For CA apply thin type to both surfaces, wait 30 seconds, then glue again using thicker CA. For PVA it seems to benefit from a light sanding, with PVA on both surfaces, but it needs clamping. Yellow wood glue (aliphatic resins) is better (and much stronger) but it still needs to be clamped for at least 30 minutes. 7mm scale means you'll be able to use bolt heads, washers and nuts (at least on the visible side). Grandt Lines has the gear for this. A 3" thick top and 8'6" width planks sounds like old sleepers sawn in half with the edges trimmed. Any evidence of chair bolt holes in the photos? The one I modeled in 4mm scale had the holes and the outlines of the chairs (old dart points have their uses). Funny you should say that Nigel, the trial pieces did dry with good joints. Problem was that the truss sections are somewhat complex and trying to hold that together while glue set would take too long. With styrene I'm in my comfort zone and the gluing, while a tad messy, was straightforward. For carriage bolts, I've been drilling and using 0.45mm NS wire filed flat. 0.45mm = 0.77in so quite close I think. I don't have any photos of the platform, just the drawing. You may well be right about the holes and I shall be looking at that later. I'm still dithering in my mind about the sort of platform I want/need. The platform I have built seems a bit short - suitable for just one coach as it stands. Must do more tooth sucking. I did find a potential source of reasonable priced coaches: http://www.iankirkmodels.co.uk/ and left a message about terms for shipping here. 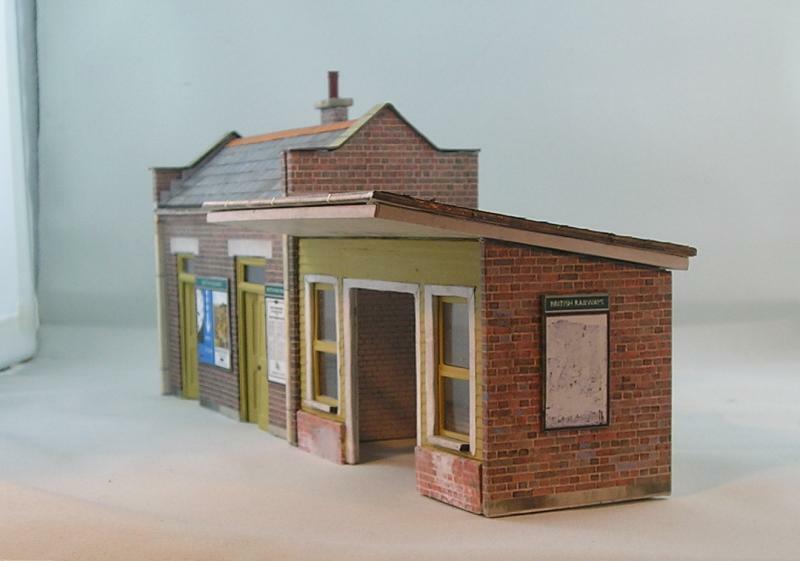 I spent a few days this week working on yet another Scalescenes kit, this time the small station and waiting shelter, R003. These kits do make up into very pleasing models, despite the lack of texture. My thinking is similar to that of my first layout where I built a number of Superquik and Metcalfe buildings initially to get things going. Later on, I rebuilt most of these in plastic using scratchbuilding techniques. I like the idea that the kit designers have done the architectural research since I haven't a clue. These buildings will do for a start. There are some elements of the building where texture is a must and I spent quite a bit of time effort on these. Window and door frames and doors were made from Evergreen plastic. The shelter front and back walls were made from Evergreen clapboard. The shelter front was quite taxing but I got it to be acceptable eventually. Chimney is W/M from Dart Castings. Looking good. One thing to keep in mind: A 0.25" setback in a mortar line between bricks is 0.145mm in 7mm scale. Most railway structures used flush mortar lines (reduces frost damage), no setback. Go to engineering bricks with their smooth glazed surface and printouts are fine. As you say, it's the corner/door/window treatments that bring it to life. I'm discovering that things scale out smaller than you might expect - being used to 4mm. Apart from that, I could never hope to replicate the brilliant rendering of the bricks (and other elements) - worth it I think. I quite like the roof tiling method of overlaying printed strips in an alternating pattern. Again a subtle representation of overlapping tiles. Yes, I think the proper windows and doors are the important thing. You've managed to blend all of the media very successfully, John. Nice of you to say so Max. Getting paper to stick to plastic without making an awful mess can be a trial. Two good guards (one for the GW toad and another in anticipation of the upcoming Dapol 20T BR brake), a diesel driver for the Class 08 and two steam loco crews. I'm pretty useless at faces so tried the impressionistic approach with black wash. I mostly use acrylic, but I did mix up a batch of flesh as recommended in an article in MRJ 230. You need enamel paint and mix of white, red, yellow and blue. The paint layer needs to be thin so as not to fill the fine facial features. They are as good as I've seen, John. I must contact ModelU, as I need a pilot bust for my 1/4 scale Piper Pawnee-25. Yes Max really good figures and so they should be since they are scans of real people. My only beef is that the faces are too realistic. Whitemetal figures tend to have exagerated facial features which make them easier to paint. 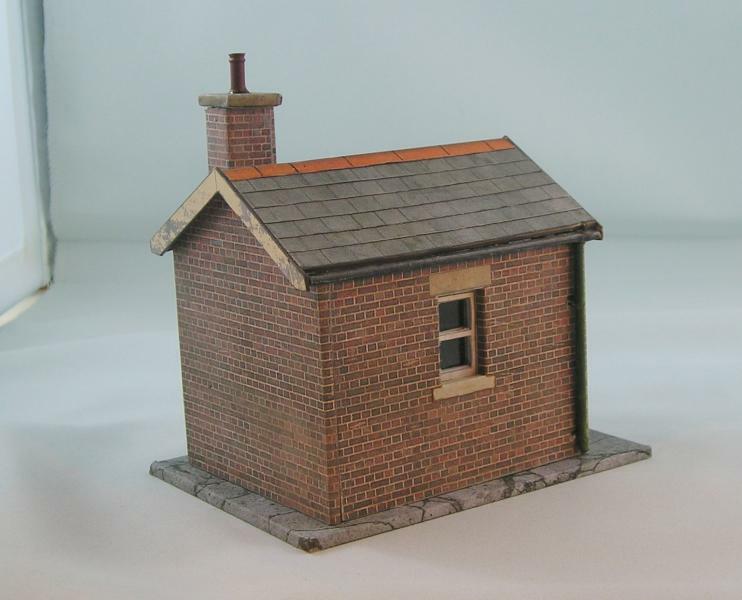 ...and now for something different, a signal box. I need to really seriously think about getting the main layout planned and to do that I need to get a sense of the building footprints. I could do foam core mockups but where's the fun in that. I bought a couple of LCut kits (http://lcut.co.uk/index.php?page=pages/main&title=Main) some while ago and thought I'd have a go at building the Signal Box (the other is a single road shed). There are a good selection in both 4mm and 7mm. The buildings seem to be generic and there's no indication in the description of the origins of the buildings. LCut kits are laser cut card kits. The parts are very crisp and precise and fit is excellent. 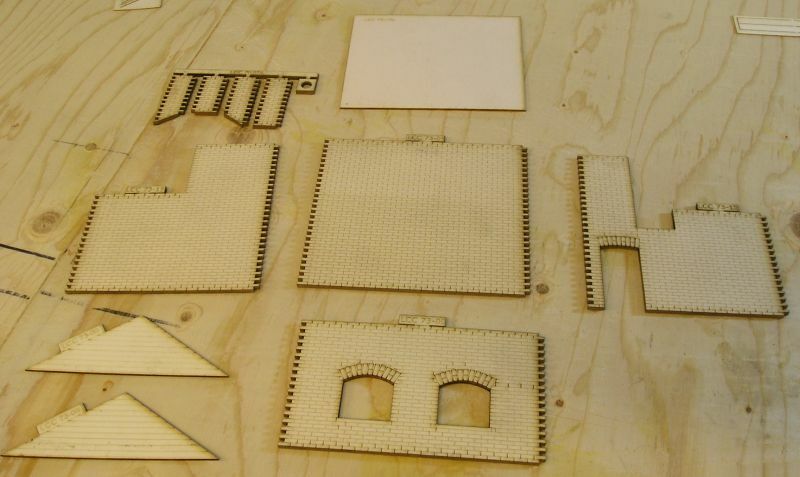 The price for an 0 gauge is very reasonable, about 1/3 of that for a laser cut ply kit. So, good value I think. One of my first concern was the walls, the bricks to be precise. I really couldn't see how to do the mortar lines. I did try, honest, but I didn't like the result. As I looked at things, a light went off, why not use Scalescenes to create a hybrid model. This I did by buying R010 Signal Box and TX01 Brick. 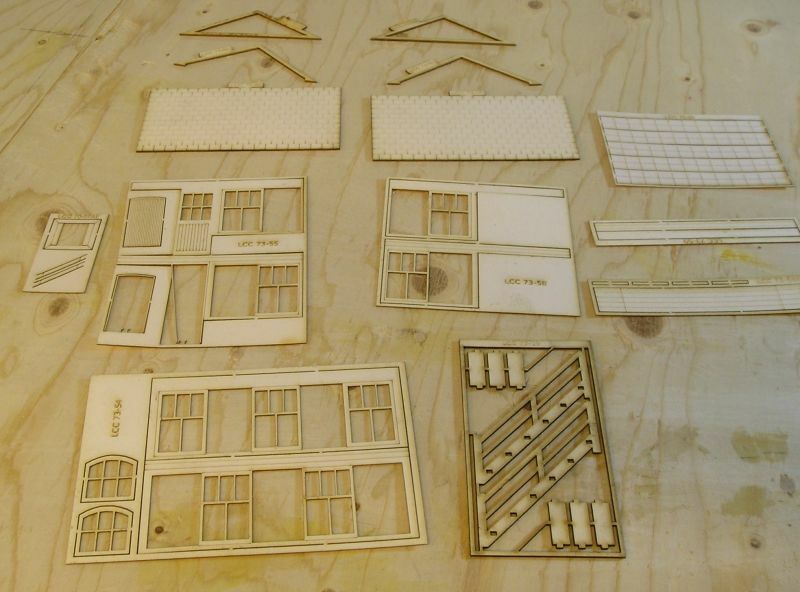 One of my issues with Scalescenes is that windows must be laboriously cut, laser cut solves that problem. If you know what you are doing, you can buy building components. Over the course of yesterday and today, I felt my way through the kit, using Pritt to stick paper brick on the card walls. I also assembled and painted the windows and doors, as well as the steps. The roof was done using overlapping paper strips. The corners are probably the ropiest part but don't look too bad. You really can't better John W's brick rendering and even in 7mm, I don't thick mortar lines have much depth. The Scalescenes kit has some printed details that I can use. I'll create side walls using Evergreen sheet. I also have a set of levers.